would have been good PR for tippmann if you did get more involved in the game head to head and someone managed to win a marker. i kinda thought the same thing but, that was the smart thing to do. only real thing i was impressed by was the he played smart all 20 games without being flashy or overconfident. i personally would have gotten bored and probably done something stupid but thats just how i play. and that's how all the challengers should have played, they had nothing to lose so they should have gone all out and played a little stupid and made things interesting. I would have liked to see you make it more of a challenge for yourself. Since your supposed to be so great, you should have evened up the odds between yourself and each challenger. For instance, you got two pistols and each challenger only had 1. Another thing I did not like was that if time expired the challenger lost. I watched several matches where you stayed in a corner of the building just waiting for them to walk through. why not go after them? just my two cents. Plus, if even one of your two pistols went down, the game was reset. I guess 1 gun vs 1 gun wasn't even. Especially since you had extended mags and the challengers had what? 2 mags total? Last edited by JOESPUD27; 05-22-2012 at 06:33 PM. I never said i was the greatest for the record.... thats word of mouth that did that..
**Do not under estimate yourself and do not get cocky (like 50% of the players of the 22) +Play Smarter, not Harder. After EVERY match I told everybody good job, fist hit/handshake the works.. a laugh or two- even though I heard them bad mouthing me behind my back.. everyone there can say that not once did I put up a cocky front and if anybody said anything, I still give them respect. I was being cool with everybody, but paintball has a lot of sore losers, unfortunately. My end: 22 people .. back to back .. Running, Gunning, Snapping, Hunting.. 87 degrees..
few Cameras/ 2-4 Refs (I almost shot each of them at least once), I started off with standard 4-6 mags? then just had 2-3 standard mags, chopping paint (one game was reset because the paint sprayed for a whole clip, so i told the ref to swap all the paint even for the challengers), second gun went down briefly.. ran out of air.. I had not the best luck, but still did what I had to. Their End: 100% Energetic, Free Shirt, $220 prize for one shot.. Time limit to come shoot me.. DOES IT GET ANY BETTER THAN THAT?! Tippmann chose few kids, some teens and experienced adults.. there were definitely some experienced ballers.. and they still lost and I won't name them even though I know who they are specifically.. few stalemates, few close ones, few one ballin', few snapping.. I even caught one guy off the break my favorite one. People knew the time limit be aggressive or lose.. and if your aggressive enough it's then time to show your skill with the snap shooting... those that made it to that point (A LOT) were then tested..
Tippmann and I struck a deal any 3 shoot me, get a pistol.. I go undefeated? I giveaway a pistol to someone of my choosing for the Blood Legion thanks to Tippmann, and I gave it away to The Blood Legion Medic* -that poor girl hustled like no other... welts, dehydration, and nothing but the most exhausted face I've ever seen.. I saw her get lit up by a group (3-8) of electro's a few times trying to save one guy while all of those horde guys were badmouthing her "GTFO OUT! MOVE! EF'N RUN OUT THE WAY etc etc"
So Tippmann gave away 22 shirts and 1 pistol regardless.. they didn't have to do any of that.. on top of the great tech support they gave out across the weekend. Out of 9 quadrants of the field I fulfilled 6 of them, during the full 22 games. I started off running around then I had to pace myself. The cool part about the buildings were that there were nets.. so when you enter the building you can see the other person, then it turns into who can snap the best.. So all in all, Everyone got free shirts A dehydrated medic with HEART won a Pistol and my reputation is shown to others that Im not all hype.. (from what they told me) It was a good Friday.. and I was spent... Video from both views on the way..
Last edited by MIDNIGHTANGELZ; 05-22-2012 at 09:13 PM. It sounds like you have some valid points there, Bits. Weltman is right, it does sound like Bits has some valid points. Sounds like. Unfortunately, it stops there and I'm surprised at you guys. 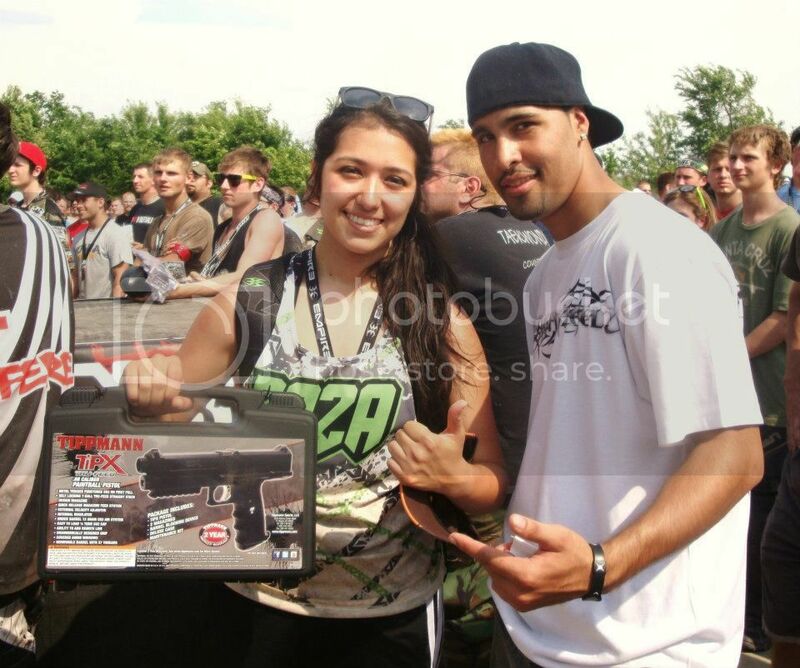 Instead of running around the field smoking folks on his helmet cam and doing whatever he pleased, Angel got together with Tippmann and CPX to give away some swag. To give back. He did it to be a good sport. Y'know, like you guys aren't being at all. Yes, the challenger lost if time expired because A. hundreds of people were waiting for us to clear that field so THEY could play there. B. The first three people to shoot him got a free pistol. That was the game. You can't just make up your own different game and then criticize him for playing the actual game and not your imaginary one. Speaking of imaginary, extended mags where? What? How does he get basely slandered for using equipment that DOESN'T EVEN EXIST???? There are no extended mags for the TPX. It wasn't supposed to be a 'challenge' for Angel, get it? Angel, Tippmann and CPX didn't do all that to feed his ego. THEY did it to provide a fun event and give away a pistol or two. The challenge for Antonio was a death march of standing in the sun and playing 22 games in a row, he was 'on' for 2 hours out there I would say and he gets criticized for not running laps around the field, awesome. Angel isn't 'supposed to be so great' as bits so SNIDELY phrased it. He doesn't have to. That's why us smart players did not 'go all out and play a little stupid', all that would do in this case was cause you to get gunned down in the process of looking stupid. Weltman and I started this discussion in person a little, and thinking about our discussion afterwards I realized I owe Weltman a really big apology. I've seen Weltman at games and events for AT LEAST the last 15 years. Who I walked a wide circle around for 10 years because in my uninformed opinion at that time, he was an ego-mad braggart. Now I know he's just unselfconsciously enjoying himself, but back then someone who showed up at the monster game with a lever paintgun and no shirt on looked like he was telling us all we weren't DOO. About 5 years ago a true friend of mine at HS really called me out on this and told me what a bigot I was being. Out of respect for him, I gave Weltman a chance and found one of the nicest, most honest guys in paintball. So I apologize, Weltman, for judging you without getting to know you and I ask you not to make my mistake with Antonio. If you get to know him and don't like him, fine. Don't treat feelings and impressions as facts though. EDIT: I just did a preview of my post and saw Angel's show up. Again he was polite and humble, in this case he was polite and humble to a group that doesn't deserve it. He's a nice guy, MUCH nicer than I am as instead of declaring an unnofficial game for TWC and trying to get Tippmann and HS on board, I'm going to plan on extra chill time. As Cartman would say, "screw you guys, I'm goin' home." haters gonna hate! Good for you Midnight! Keep doing what your doing! Pimpin' ain't easy but p8nt pimpin' is fun!! Last edited by Tick; 05-22-2012 at 10:59 PM. yea... Im sick and tired of being sick and tired of some of these peoples posts... so I just take a chill pill..
Last edited by JOESPUD27; 05-22-2012 at 11:50 PM. Extendo's don't exist. The ONE time the game reset was because of a full mag spraying at your little guy and his rounds were spiraling I saw! So I did both of us a favor told them to switch out all the paint and reset the game. I was standing out in the open and he still couldn't hit me so YOUR WELCOME for giving HIM a second chance. I was running around for the first few games but said SCREW it its 87 degrees and I have 18 more games? ..pace to win. Im not pushing the game tempo to excite anyone and collapse on the floor LOL! I WANTED PEOPLE THAT DID USE PISTOLS! What did you guys send 3 total grief peeps after me? I recognized the pants. Last edited by MIDNIGHTANGELZ; 05-23-2012 at 12:18 AM.